Essences are fun and very easy to make. On top of that, the possibilities for stone combinations are practically endless. Below, you’ll find directions to safely creating crystal essences for yourself and your animals. This is actually much easier than you might think. I usually tell my clients to just choose the stone or stones that their eyes drift to. Keep your intentions for the essence and what you want to achieve with it in mind when selecting crystals and the right ones will draw your eye to them, naturally. 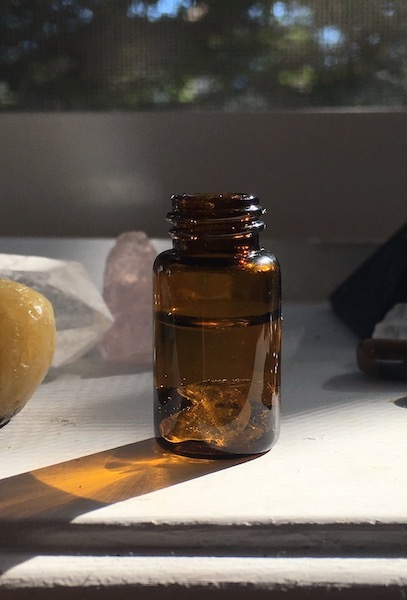 To ensure that the essence is made using crystals that are purified, leave your selected crystals in sunlight or by candlelight for a couple of hours. This clears away any unneeded energies that the stones might have picked up. Just a drop or two of essence water is enough to energize a glass or bowl of drinking water. You will need a clear or coloured glass bowl or drinking glass (Personally, I sometimes use wine or even shot glasses). Place the cleared crystals you’re using in the bowl or glass, if you’re certain that they’re nontoxic. Fill the bowl/glass with spring water and make sure that the water level rises completely above the tops of the stones. and place outside with a plastic film covering the top (so no bugs or dirt/debris settle in the water). Alternatively, you can place the bowl or glass in a window indoors in the sunlight. Leave the bowl and crystals in the light for 2 to 4 hours. If you’re using stones that are toxic or especially fragile (for example, Selenite is a stone that dissolves when placed in water), then use this method instead. It’s just as effective as the direct method. Place the crystals of your choice in a small glass container (this is where shot glasses can come in handy). Then place that small glass inside of a larger glass bowl or drinking glass. Pour the spring water between the two glass containers so that it doesn’t actually touch the stones. Once again, make sure that the water level is above the tops of the crystals. Set the glass containers and crystals outside in the sunlight, or inside in a sunny window for 2 to 4 hours. After the 2 to 4 hour period, remove the crystals from their glass containers using a clean spoon (avoid putting your fingers in the essence water – this could compromise its energy), rinse the crystals off and pat dry. You can either pour all of the essence water directly into your pet’s drinking dish or a drinking glass for yourself, or you can preserve some of the essence and use just a small amount at a time. If you want to preserve some of the essence for future use, pour the essence water into a freezable container and place in your freezer. When you want to give your pet some of the essence, take the container out of the freezer, allow it to thaw just enough that you can pour a few drops into the animal’s water dish, then reseal the container and place back in the freezer. Alternatively, you can also pour the essence into an ice cube tray, freeze it, and just give the animal an ice cube at a time. When offering an essence to an animal, always give them a bowl of regular water alongside the dish of water that has the essence in it. It’s important to allow pets to choose when they receive crystal energy. Crystal essences can be helpful with all kinds of issues, whether they’re physical illnesses and ailments, or mental and emotional concerns. There are many different resources online and in books for determining which issues certain crystals can be beneficial for. A couple of my favourite books are “Crystal Prescriptions: The A-Z Guide to Over 1200 Symptoms and Their Healing Crystals” by Judy Hall, and “Crystal Healing for Animals” by Martin J. Scott and Gael Mariani. Crystal essences can be beneficial for all living beings, not just humans and domesticated animals. Try offering some to the wildlife by putting a couple drops of essence in the bird bath in your backyard. You can even use these essences to water your plants – try it and see how it changes the way that they grow and bloom. Have fun making the essences and experimenting with the different possibilities.